Off we went, on a typically humid morning, to Juma’s home. A few hundred people had gathered under the awning. The women sat on the floor and wailed; the men stood or sat on wooden chairs wiping sweat from their brows. My male colleagues, mostly Tanzanians, and I were ushered firmly onto seats at the front; the other girls from the office – locals, all – disappeared into the sea of womenfolk. I, on the other hand, had front row access to something I’d been asked to photograph – wasn’t I lucky? Nope, I just sat there feeling conspicuous, hoping I wouldn’t have to get any closer to the open coffin – till Cranmer, my boss, elbowed me: Have you taken some pictures? I snapped a few of the crowd, discreetly and respectfully, I thought. A quick few of my colleagues filing past the coffin, a few as we finally departed. People didn’t pay much attention. Back at the office, Teddy, the security guard who’d had to stay on duty, came to my desk. Teddy had worked with Juma for years. And he wanted to see the pictures. How disappointing then, that none of them showed his face. 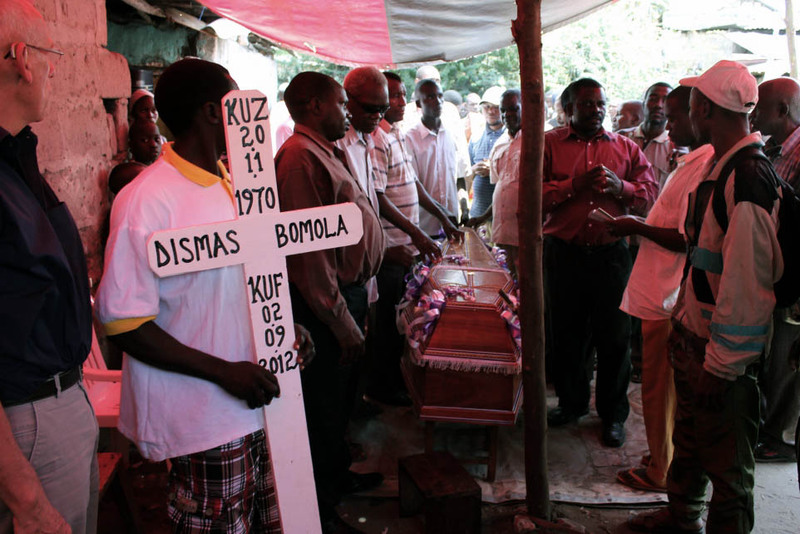 It turned out that my colleagues wanted those memories – not just of Juma’s life, but of his death: of his funeral, of his body. We’d been triumphant, the day before, when we finally found a good photo of Juma with his young wife. And still I had utterly misjudged what a photograph could mean. To me, it was an intrusion. To them, it was a thing of value, and in being taken, something that gives value to its subject too. But of course, my colleague Frida explained to me later. A family will sometimes hire someone to photograph a funeral and leave them with a souvenir CD. There’s a striking image of death by the giant of photojournalism, W. Eugene Smith. (He was famously protective of his work, making it hard to find his images even today – see here for a reproduction). Thanks to a chance encounter the day before, Smith was allowed to visit the deathbed of the Spanish villager (the story is retold here). In that most private of spaces, he took photos. But he also went a step further, moving around his subjects and modifying the lighting to get a good picture. Lesson number 1: if you’re given access, use it. Perhaps, though, in the age of smartphones and Instagram, death pictures just aren’t that taboo anymore. Or are they? The current mass observation project, gathering ‘anecdotal evidence from people’s everyday lives and experiences’, had funerals as its theme recently. Martin Parr, who set the theme, writes: “One of [the unwritten rules about photography] is that it is perfectly OK – even encouraged – to shoot photos at a wedding but not at a funeral. Our job, if we have any value as documentary photographers, is to question these rules.” People seemed pretty happy to go out and break the rules (though interestingly, the ‘funerals’ assignment has attracted far fewer comments than ‘breakfasts’ or ‘smokers’). Sometimes though, it’s not about the value of documentary, or about the grand notion of an ‘anthropology of ourselves’ which might mean a small something to the world. Sometimes, the value of a photograph is in a memory that means a huge amount to a wife or a son or a friend. Either way, take the picture. It might be worth getting told off.